David Ford’s abrasive style is on full display in his exhibit, “Bare Edge,” at the Bunker Center for the Arts. 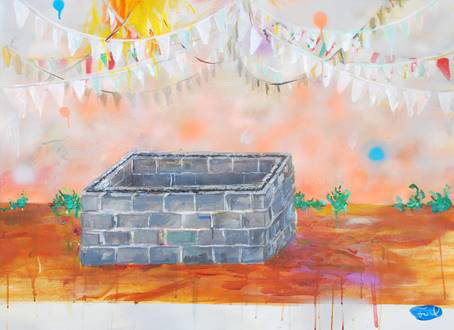 Containing paintings and assemblages made from 2014 to 2016, the show is a colorful and surreal exploration of Ford’s travels to Cuba, Ethiopia and Haiti alongside works about the USA. Pleasantly, Ford’s exhibition is not the typical celebration of multiculturalism, nor a straightforward critique of colonialism. Instead, Ford’s painting’s force viewers to confront their own understanding of foreign and domestic cultures. The exhibition’s most compelling painting is placed front and center in the first room of the Bunker. “White Treat” is a large, radiant yellow painting. In the center, the head of Ganesh, the Hindu elephant god of wisdom and art, stares back at the viewer. Surrounding his visage, dark-skinned people toil with sledgehammers, while a pair of white-skinned people stand upon a rock precipice. No faces are visible on the human figures, and names and cryptic phrases like “White Treat” are written on the painting. Further into the exhibition, the painting “Leslie” depicts a similar scene in which white-skinned figures ride horses in a river, while dark-skinned figures wash laundry. In the very back of the exhibition, a room contains just two paintings. One titled “Negra” depicts a dark-skinned figure holding a broom. In a surrealist gesture to Magritte’s “Son of Man,” a pineapple obscures the man’s face. Across from “Negra,” a second painting titled “Thank You” appears to depict Barack Obama. The President stands in front of the White House, his arms holding a garden of flowers from which emerges a rainbow. Notably, the President is depicted with bright white skin. Ford’s painting’s are too intentional to be random, but they resist easy explanations. “Bare Edge” is not a travel catalogue that will perfectly explain a foreign culture. Instead, as we search for meaning within these images, they expose our own beliefs and feelings. You cannot really read these paintings, as much as you can project your own biases and insecurities onto them. In a world with Wikipedia, a world that is fully catalogued, these paintings expose Ford’s encounters with foreign cultures while maintaining the uncertainty he must have felt in the moment, before he came to fully understand what he was witnessing. But a few artworks in the exhibition focus directly on America. In the front room on a table, a wood cutout of a human figure lies on a cabinet door with an American flag protruding from its mouth. A cheap plastic fan blows the tiny flag. The work’s title? “Perpetual Motion,” surely a jab at the artificial, blowhard nature of American nationalism. One artwork, made before President Trump’s election, feels a bit omniscient of our current situation. “Pay No Attention to the Man Behind the Curtain” is made of three large pieces of glossy tag board, painted like a child’s paper playset of the Emerald Palace from the Wizard of Oz. Instructions on the tag board say things like “Bend All Scores Lightly,” “Insert Toothpick,” “Fold Here.” On one of the pieces, a little man with golden hair gestures frantically. You don’t need to be a Hindu scholar to interpret these messages. A simple understanding of eastern philosophies of yin and yang, of the balance of life and death, of beauty and violence, is enough to read this painting. This idea, that ‘all die,’ couldn’t be more different from the ‘perpetual motion’ of American patriotism, a philosophy which seeks to avoid the inevitability of death and hold onto ‘full power” for as long as possible. Over the last few decades, Ford has become a pillar of the KC art scene, and yet for all his association with Kansas City, he has spent a lot of his time elsewhere. “Bare Edge” brings Ford’s experiences abroad back to Kansas City. For an artist as well travelled as Ford, the blustering, bellicose patriotism that currently affects so much of this country must seem like a bit of a joke. As the empty philosophy of “Make America Great Again” takes over the nation, Ford brings us artwork that forces us to question our place in a much larger world. “David Ford: Bare Edge” continues at the Bunker Center for the Arts, 1014 E 19th St., indefinitely. Hours are noon to 6 p.m. Thursday-Saturday, 12:00 pm – 6:00 pm. For more information, 712.314.0478 or www.facebook.com/bunkca.